We can’t even imagine the logistical nightmare that is producing a show like Sense8, and as creator Lana Wachowski describes in a new video, it’s every bit as chaotic as you’d expect. But Wachowski is also the first to bring up the utter joy its cast and crew has felt. And now that Netflix has responded to the public outcry and decided to produce a two-hour finale to the series (it was previously canceled, much to the the chagrin of many LGBTQ fans), the team is back together unexpectedly. 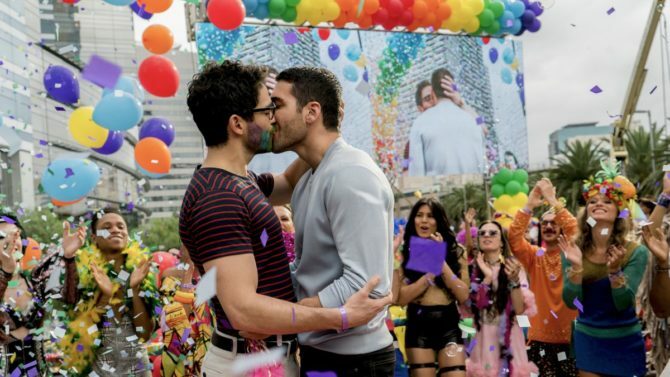 Related: Straight guy goes on homophobic rant about ‘Sense8’ and the Internet shuts. It. Down. Directors Tom Tykwer and James McTeigue join Wachowski in the video, along with cast members Doona Bae, Jamie Clayton, Tina Desai, Tuppence Middleton, Max Riemelt, Miguel Angel Silvestre, Brian J. Smith, Toby Onwumere, Freema Agyeman, Alfonso Herrera, and more, who all express gratitude to the fans who brought the show — however briefly — back from the dead. Oh, and they also say the finale is going to be “epic,” and for once we have a feeling the word isn’t being used lightly. Sense8 returns for a two-hour finale special on Netflix in 2018. It wasn’t a good show. You should change your name to KaiserVonShite because you are full of shite. Nice attempt at trolling, you big old TROLL. It is so much more than good. right….it is a G R E A T show. It’s such a great show,but it’s just so huge,expensive and so extra.Netflix feels that the view count doesn’t make up for the cost,despite good reviews and a cult following. Estimated 9 million per episode. Netflix’s problem is that for some reason they don’t properly promote this show,giving it the exposure that it needs. That was the big criticism when they announced cancellation. I’m excited for this,but….this was suppose to be a 5 season story. SMH. I suspect that this is one of those shows that will recoup its production costs over the years, if not decades, of being replayed to a loyal cult following. Eventually, it will go mainstream and “everyone” will look back in retrospect and acknowledge that “of course” it’s a classic. The introduction cutting through multiple cityscapes is a work of art. ….. I’m thinking of shows like the original Star Trek, Dr. Who, or even the movie Rocky Horror Picture Show. ….. Meanwhile, those paying the bills are closing it because it’s not making enough immediately. So much for them being a patron of the arts. the only thing that i can say is thanks, this show is only one that i was touch by. now i get to see an ending to what happens with the people, thanks again. and to those that put so much into the show, a very big thanks to you all. Coming back in 2018? That’s the best reason to keep slogging my way through daily life. I was/am absorbed by these characters. Each has woven themselves into my life and under my skin. Lana has succeeded. We can all see ourselves in one or more characters. As an elder gay white man, I am thrilled to tears seeing such beautiful relationships. It did take a while for me to catch on what the heck was happening. Worth each minute. I get it. All my love from Humboldt County, CA. It’s only coming back for one more (2-hour) finale episode. Just 2 hours yeah but that is way better than nothing. We’ll be able to wrap things up and get some sort of closure to the story. Who know, maybe the viewership on the day it comes out will be so enormous it raises eyebrows. I know I’ll be plugging for it when I have the release date. I’m a Tenor in the San Francisco Gay Men’s Chorus. We sang in the first episode of Season 2 in the Christmas sequence shot at San Francisco City Hall. Thanks, SENS8, for being such a positive force for understanding in the world when it is SO desperately needed. Epic? Does that mean no more 3-minute music videos and an actual story, plot, and character development? Could we get more of Bug? He’s just awesome. Or, how about another unrealistic coming out story? That wedding speech was so spot on and the closeted movie star. Please, put an awkward Marc Jacobs back in a oh-so-typical LA celebrity party scene. The show was crap. A well-done series. Very engaging.